This recipe is so easy and simple that I almost feel stupid posting it, but I decided to share it anyway because it’s been my favorite treat so far this summer. It’s delicious, but it’s also healthy – less than 100 calories plus one whole serving of fruit! 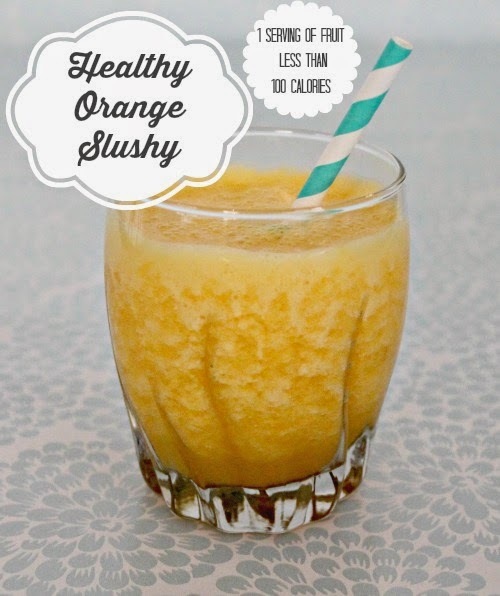 All you need is a blender and 3 ingredients to make the perfect orange slushy! Now just blend all of the ingredients together! I like to use my Magic Bullet, so I usually blend the orange first and then add the ice and sweetener. My Magic Bullet seems to crush ice better if there’s a lot of liquid, but if you have a nice blender you can add everything at once. must try this Sam! Thanks! Sounds yummy and so easy! I definitely need to try this!